Here’s a pop quiz for you. When was this chair designed? If you guessed ‘last year,’ I don’t blame you. It’s got a fashion-forward pinkness about it, and the combination of circle, curve and triangular wedge has the minimal snap of the latest out of Milan. Or perhaps you went for ‘1981’? I wouldn’t blame you. The chair does look pretty postmodern, and even bears a passing resemblance to Peter Shire‘s iconic ‘Bel Air’ chair of that year. Both the mystery chair and Shire’s Postmodern design have similarly disjunctive compositions, with curved, angular and round shapes smashed together. They are like almost-accidental masterpieces. But no. The pink chair was designed way back in 1968, and by someone you may never have heard of, unless you are an insider in British design circles. Her name is Jane Dillon. Here’s a picture of her, sitting in one of her other chairs from the late ’60s. Back then she was going by her maiden name of Jane Young, and young she was, too: a recent graduate of the Royal College of Art, in her mid-twenties. 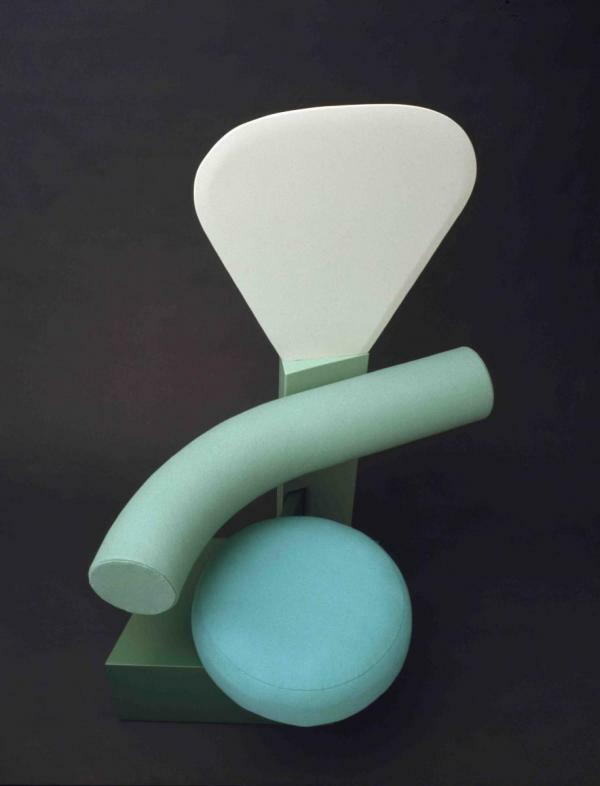 She found her way to the Milan studio of Ettore Sottsass, the famous Italian designer. 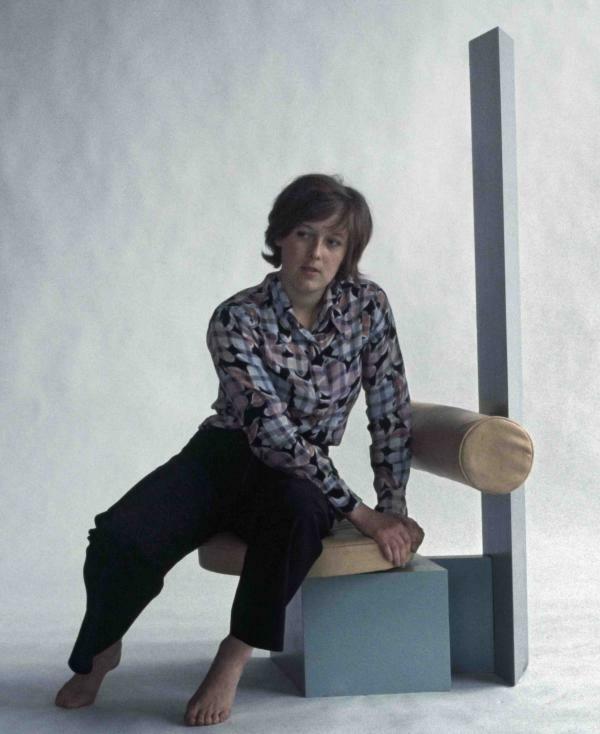 For the most part she worked on colour studies for a line of office furniture he was doing at the time for Olivetti. But she also worked out some absolutely amazing chair designs. Dillon has just given the Archive of Art and Design at the V&A some precious archival materials, including the pictures I’ve included in this blog post, and also some of the preparatory sketches for the chairs. Here are one of the earliest development drawings – with a tentative title of ‘T-Time,’ a reference to the idea of including an integral table in the design – and a geometric study showing the plan of the chair (as if viewed from above). And here’s another motion study, a quick sketch in red pen.The two vignettes at lower left again show the chair in use from above. The idea being shown is that as the sitter shifts her weight from side to side, the seat beneath her (and the other elements of the chair) will move on a swivel joint. As stylish as the chair looks today, from Dillon’s perspective it was mainly an exercise in dynamic ergonomics. 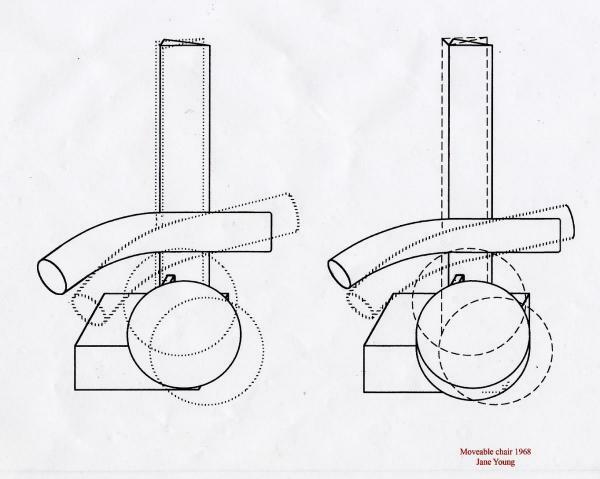 The motion study above indicates this, but it’s clearer still in the final preparatory drawing below, which shows how three of the chair’s four parts swivel in coordination according to the user’s shifting posture. 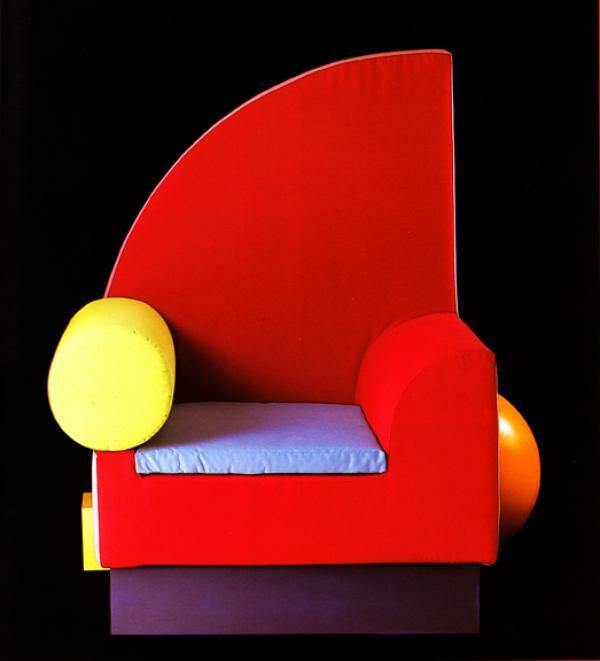 She thought of it as a functionalist experiment, more late Bauhaus or Gerrit Rietveld than Pop or Postmodern.